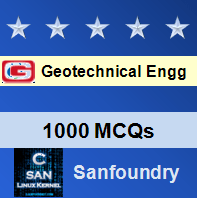 This set of Geotechnical Engineering Multiple Choice Questions & Answers (MCQs) focuses on “Steady flow to a well: Dupuit’s Theory”. 1. Which of the following test is commonly adopted for determining soil permeability of soil formations? Explanation: Pumping-out test is the frequently used field method, as it involves discharging water from the ground. Explanation: Since specific yield is the volume of water drained, the drainage of water depend on grain size, shape and compaction of stratum in the soil. Explanation: Specific yield is an indication of the water yielding capacity of an unconfined aquifer. Explanation: The theory proposed by Dupuit’s on radial flow was modified by Thiem in 1906. Explanation: The parabolic depression formed when water is pumped from the aquifer through well can be called as cone of depression or the drawdown surface. Explanation: By pumping test method, the value of storage coefficient ranges was found to be in between 0.00005 to 0.005. 7. Which of the following is depicted by Dupuit’s theory? Explanation: The analysis of the radial flow of water to a well was originally proposed by Dupuit’s theory. 8. The co-efficient of transmissibility (T) of an aquifer is given by which of the following equation? Explanation: Based on the assumption proposed by Dupuit’s theory, the velocity of flow is proportional to the tangent of the hydraulic agent instead of its sine. Explanation: Since the flow of water is not horizontal near wall and the flow no longer remains laminar. Thus, Darcy’s law equation is not valid near the well face.